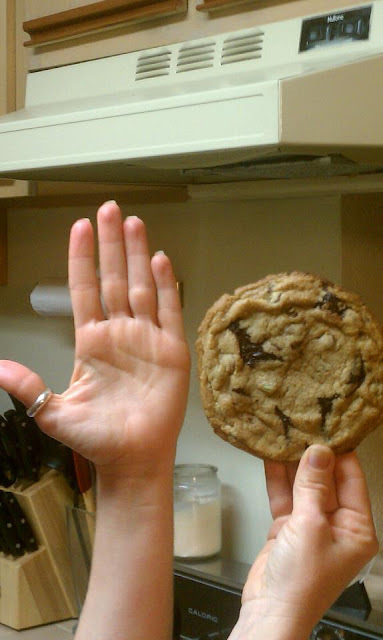 Today I bring you a wonderful Chocolate Chip Cookie! 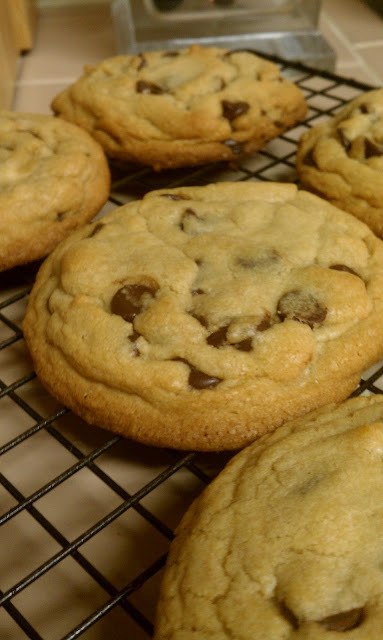 Who doesn't like a warm cookie straight from the oven? on the back of chocolate chips packages! I have found my new favorite recipe! In a large mixing bowl beat the shortening and butter with an electric mixer on medium to high speed for 30 seconds. Add the brown sugar, granulated sugar, and baking soda. Beat mixture until combined, scraping sides of bowl occasionally. Beat in the eggs and vanilla until combined. Beat in as much of the flour as you can with the mixer. Stir in remaining flour. Stir in chocolate pieces and, if desired, nuts. Drop dough by rounded teaspoons 2 inches apart on an ungreased cookie sheet. Bake in a 375 degree F oven 8 to 10 minutes or until edges are lightly browned. Transfer cookies to a wire rack and let cool. Makes about 60 cookies. ***I made them into giant cookies using 1/4 cup of dough for each one and baked for 10-12 minutes (making about 18 cookies). NOTE: When I baked these with Spelt Flour the cookies were nice and flat, but chewy and crunchy all at the same time. When I baked these with all purpose flour they were much fluffier. In the taste test...the Spelt Flour cookies won! PLEASE LIKE BAKING WITH MELISSA ON FACEBOOK!